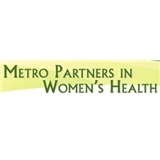 Metro Partners in Women's Health (Novi) - Book Appointment Online! We are a group of six obstetrician-gynecologists and three nurse-midwives. When you choose Metro Partners, you benefit from our entire team. We each have years of experience and stay on the forefront of women’s healthcare, so you can feel confident that you are in good hands. And while we are each different in our own way, you will find we share a dedication to you. We believe in investing in building a relationship with you-one that can make a big impact on the quality of your healthcare experience. She made me feel really comfortable and answered all of my questions. I would definitely return to her!